I’ve had these brownie bites pinned for quite some time now but never got around to making them. When I was going through my Pinterest looking for recipe possibilities to make for the party we were having, I checked out the recipe for this and couldn’t believe that I had all of the ingredients currently in the fridge and the pantry. I took that as a sign that I definitely needed to make these. I prefer bite sized desserts to anything that needs to be sliced/cut/served on a plate. Not only is it easier for a party, but it’s built-in portion control. That is, if you’re lucky enough to be able to eat one or two of these and then walk away. 1. Place caramels and the heavy cream in a microwave safe bowl and heat in 30-second intervals, stirring each time, until fully melted and smooth. 2. Preheat the oven to 350. Spray a mini muffin pan with non-stick cooking spray. 3. Roll out each pie crust and use a 2 1/2 inch cookie cutter to cut out rounds. Place the rounds in each mini muffin cup, pressing up the sides. 4. Add a drop of caramel into each mini muffin cup followed by a pinch of the chopped pecans. 5. In a large bowl, prepare brownie mix according to package directions. 6. Spoon brownie mixture into each mini muffin cup until full. Bake for 20-24 minutes or until a toothpick inserted in the center of the brownie comes out clean. 7. Remove from the pan and allow to cool on wire racks for at least 30 minutes. 8. Microwave caramel until it reaches drizzling consistency. 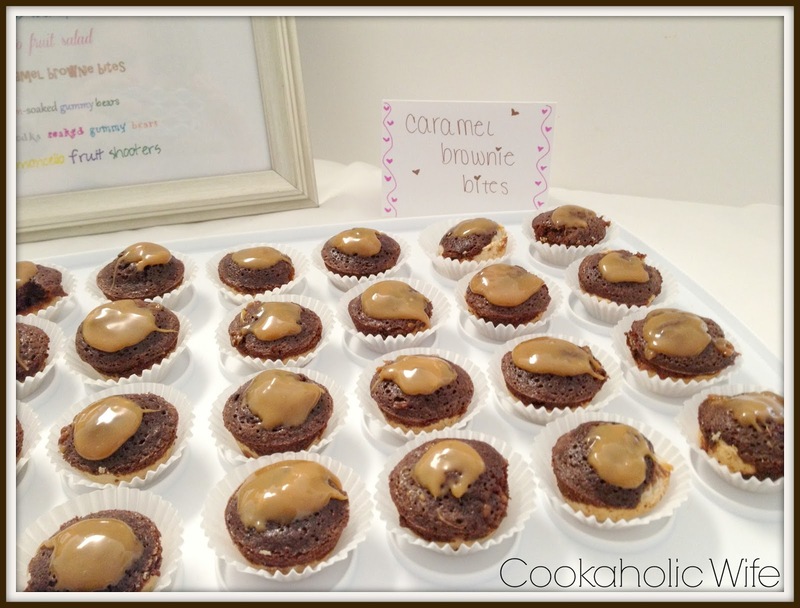 Dip each cup into the warmed caramel, swirling to remove excess. Refrigerate until ready to serve. The original recipe also calls for a chocolate ganache to go on top of the brownie, but I thought that was a bit of overkill. After the party, I had 7 of these left. I think that tells you how good they are! Caramel and chocolate in a bite-sized package – sounds super delicious! We will just love your Caramel Brownie Bites, they look delicious. Thank you so much for sharing with Full Plate Thursday and have a great weekend!